Indian folk and tribal dances are simple dances, and are performed to express joy. Folk and tribal dances are performed for every possible occasion, to celebrate the arrival of seasons, birth of a child, a wedding and festivals. The dances are extremely simple with minimum of steps or movement. The dances burst with verve and vitality. Men and women perform some dances exclusively, while in some performances men and women dance together. On most occasions, the dancers sing themselves, while being accompanied by artists on the instruments. Each form of dance has a specific costume. Most costumes are flamboyant with extensive jewels. While there are numerous ancient folk and tribal dances, many are constantly being improved. The skill and the imagination of the dances influence the performance. 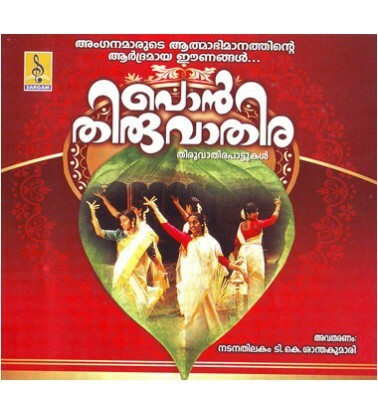 Aathirathingal Dance Traditional Thiruvathirakali song sung by Reshmi Narayanan, Manju, Sowmya, Anit..
Nadodinritha Ganangal Folk Song Malayalam Traditional Music by Jaison Sung by Denson & Reshmi , ..
Nadodinritha Ganangal Vol 2 Folk Song Malayalam lyrics Rajeev Alunkal Music by Satyan Paramesw..
Nadodinritha Ganangal Vol 3 Folk Song Malayalam lyrics Rajeev Alunkal Music by Satyan Parameswar sun..
Ponthiruvathira Audio CD malayalam thiruvathirakali dance song traditional lyrics music by Kristudas..